Three Super Eagles stars with English Premier League experience were nominated for the African Player of the Year by the Confederation of African Football (CAF) on Friday morning. Former Leicester City striker Ahmed Musa, ex-Watford star Odion Ighalo, Arsenal winger Alex Iwobi and 31 other African stars have been shortlisted for the prestigious accolade. Musa's nomination comes in recognition of his brilliant performance at the 2018 World Cup, where he became the first Nigerian player to score a brace in successive tournaments. 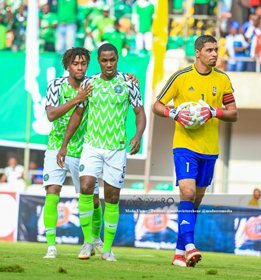 Changchun Yatai's Ighalo was recognized after notching six goals for the Super Eagles in Africa Cup of Nations qualifying, while Alex Iwobi is one of Africa's top performers in this season's Premier League. For the title of CAF Female Player of the Year, Super Falcons stars Asisat Oshoala, Desire Oparanozie, Francisca Ordega and Onome Ebi are among 15 players nominated for the accolade. In other categories, Leicester City midfielder Wilfred Ndidi and five other players will battle it out for the Youth Player of the Year, while Super Eagles manager Gernot Rohr and Super Falcons boss Thomas Dennerby are up for the Men's Coach of the Year and Women's Coach of the Year respectively. Cameroon, Ghana, Mali, Nigeria and South Africa have been nominated for the Women's National Team of the Year.